This is an ad from 1954 for Bell Telephone System. You kind of hope it is – for good news and good times often come your way by telephone. Maybe it’s a date for sister Sue. Or a business call for Dad. Or Bill asking if Jimmie can go to the movies. Or Grandma calling Mother to find out if things are all right. And everything is more likely to be all right when there’s a telephone in the home. In many, many ways the telephone is a real friend of the family. And the cost is small – just pennies a call. Local to serve the community. Nationwide to serve the nation. Well, I’m not sure how accurate the premise that “everything is more likely to be all right when there’s a telephone in the home” is, but clearly it’s advantageous to Bell to convey the impression that it’s true. I liked that the ad gave a possible phone call for each member of the family, although I felt like Dad kind of got short changed (compare the entertainment level of his call to that of his kids’) and that Mom’s was questionably exciting, depending on how nagging her mother was and how frequently she got such calls. I wouldn’t be looking forward to calls if mine were most likely to be business calls while I was home relaxing in the evening or if my mother called to nag and worry every night! No wonder the Sue and Jimmie look more excited about the ringing phone than their parents do! This entry was posted on March 12, 2010 at 12:00 pm	and is filed under Services, Vintage. 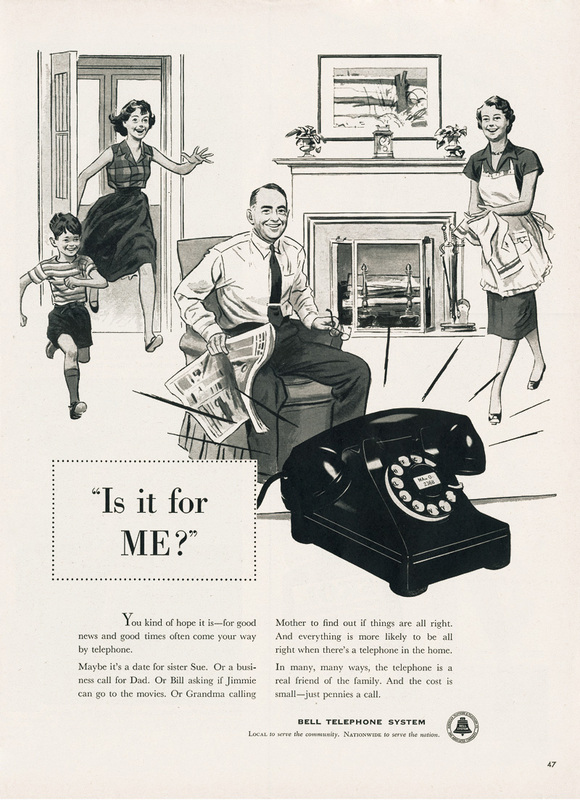 Tagged: 1950s, bell, print-ad, telephone. You can follow any responses to this entry through the RSS 2.0 feed. You can leave a response, or trackback from your own site. Hi there. Where is this ad from? If you could email me, that would be great! Thanks.